When you really think about it, you spend most of your days at work. You are there at least 8 hours per day, five days per week, for most of your adult life. With work being so present in our lives, it becomes clear how much workplace negativity affects our moods on a daily basis. You may notice when you disagree with another colleague, got poor feedback at your review, are working on a project you aren’t interested in, or have to deal with a boss who you can’t stand, that your overall mood becomes negative. While having some bad days at work is normal, it becomes toxic when you begin to feel depressed or anxious most days. If your work situation has left you feeling extremely negative, pessimistic, or depressed, there are some things you can try in order to improve your mood before taking that next step of switching jobs or even careers. 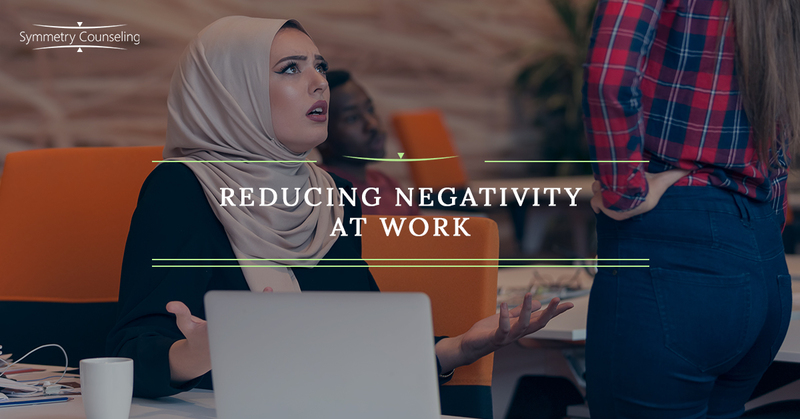 Below are a few tips that may help reduce the amount of negativity you are engaging in at work and boost your mood so you begin to feel more positive at work and at home. It can begin to feel like you have lost your voice in what is assigned to you and who you work with. Bring back your voice by making sure you do have a say in what you are working on and who you are working with to make sure you continue to feel empowered by your work. When you are put on teams or assignments that don’t interest you or make you better, you may begin to feel more negative about your work and the company. Use your voice to communicate when you are unhappy or would like to try something different. Often we find comfort in work gossip. When another colleague doesn’t like your boss either, is frustrated with management, or feels the same way you do, you feel validated and supported. There is a fine line between receiving support and engaging in more negativity. If you leave these gossip sessions feeling worse about your situation, it may be best to try to pull back from engaging in the gossip for a while. Try making the conversations more positive when you feel colleagues going down the negative route and see how you feel after a few weeks of no office gossip. You may walk into work every day with a bad attitude and negative mindset from the get-go. Try challenging that negativity every morning before going into work by naming two things about your job or career that you are proud of and enjoy. Focus on the parts of your job that made you want to work there in the first place and if there are none, it may be time to think about a better alternative for you. It is important to not let the negativity from your work environment overshadow your passion and drive. It is easier said than done to not “take things personally” at work. When you get a stern email from your boss, you may think your boss no longer likes you or may believe that you aren’t good at your job. While these conclusions are usually where our minds jump to, it is not always the case. Try to see things from the standpoint of your boss, the company, or the team as a whole rather than putting everything on yourself. Externalize the issue by considering what your boss may be experiencing, why he may have reacted in such a way, or reasons it isn’t personal to you. Doing this may help you feel less guilt and shame at the office and reduce the amount of negativity associated with that. If you have a highly negative mindset at work and would like some support to challenge it, it may be useful to connect with a therapist. Contact Symmetry Counseling at 312-578-9990 to set up an appointment with one of our very skilled therapists today!